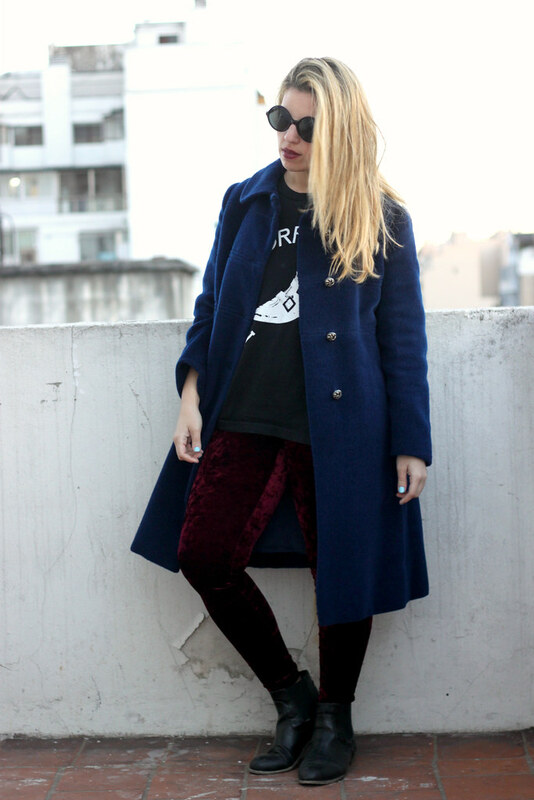 Vino y azul es una mezcla que se usó mucho en las páginas de street style del otoño pasado, así que por qué no probarlo? 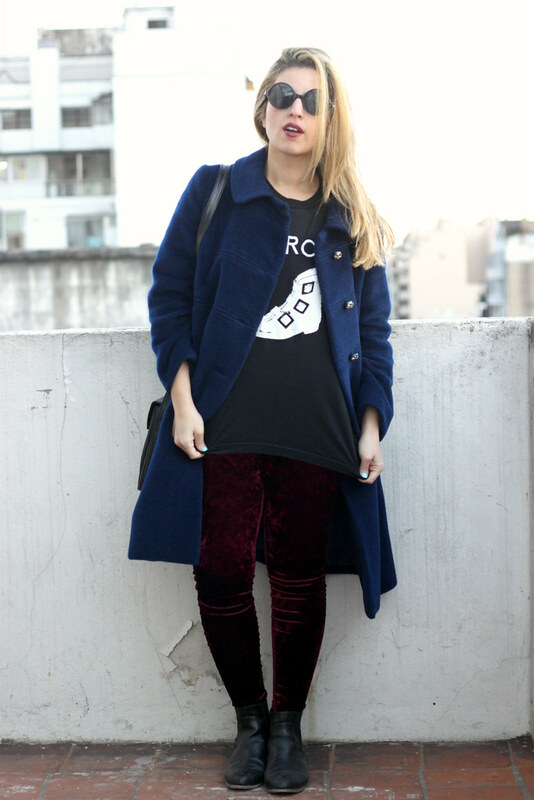 me puse mis leggings de terciopelo con una franela/remera que estaba loca por usar, la compré en el concierto de The Horrors hace unas semanas, y lo combiné con el abrigo azul que fue una compra loca porque justamente cargaba en la cartera 100 pesos y el señor estaba loco de que me la llevara, me fue bajando el precio hasta que me lo dejó en 100, y un abrigo en ese precio, tan nuevo es bastante difícil de encontrar no? A las chicas que viven en Venezuela y en países tropicales ya estos posts les van a ser medio inútiles pero pueden buscar inspiración en los colores. Feliz finde! Burgundy and blue klein was pretty much a trend during last fall, so why not try it? I wore my velvet leggings with this The Horrors band shirt i got at their concert a couple of weeks ago, and top it off with the Blue coat which I love to death, the cut and the color! and the owner of the vintage store kept lowing the price until I could afford it compulsive buyer cof cof . If you're having summer lovely days I hate you... haha, not really, but I bet these looks doesn't inspire you that much, well, I say, look for inspiration on the colors! *If you haven't heard The Horrors, I recommend you go hear Still Life, and tell me what you think of it (to me it's the song I want to hear when I have a flashback of my life, but if you're more into punk rock, listen to Sheena is a parasite, Happy Weekend! Me encantó ese tapado vintage!! 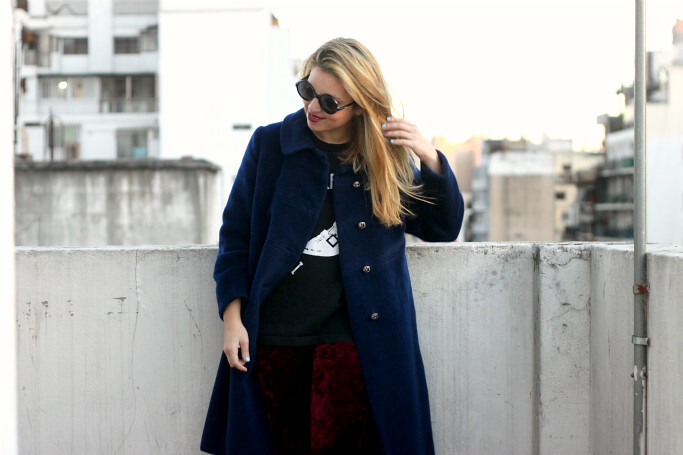 divino el look my british!